Is there a spell that can be done to "kill two birds at once"? Did a divination and it came out as break up/seperation draw a new lover to the intruder. Long story short my bf has "friends w/benefits" to say it nicely. So there not his gf's to "breakup" but obviously seperation is needed. Is there a spell that I can break em up and draw her to a new man all at once and perhaps bind her and this new man together? Did you mean that you had a reading done or that you did a divination yourself? Is it more than one friend with benefit? If so then you want to hot foot her or freeze her. The issue however lies not with these girls, but with your boyfriend. If he's a cheater then he'll find ways to cheat. So make sure to address the problem not the symptom. To get rid of friend you don't want him to have you can do a moving candle spell moving her away and him closer to you. I have looked through my HooDoo Root magic book but couldn't come up with any ideas for this particular situation. My husband ( we are seperated) has a girlfriend and I would like her to find a new lover so that I can try and reconcile with my husband. Any suggestions? I have pictures of her and her name of course. All help and advice is greatly appreciated. Try using an Attraction kit or Come to Me kit to draw a new lover to her. You can use Separation or Break-Up products on two figural candles, one named for your husband, and one named for the girlfriend to drive them apart; &/or work a vinegar jar on them to sour their relationship. At the same time work a Reconciliation spell kit and honey jar on your husband. Can red ants be used on a red vuvla candle to get someone to have an "itch" towards you? First let me say how much I enjoy the forum. To date I've only read posts, and haven't participated, but I have a question to ask now. I'm needing to prepare a vinegar bottle to break up a friendship between my bf and a friend of his, who is a previous girlfriend now just a friend most of the time. I don't believe they're intimate at this time, but she's not willing to see him partnered with another woman, especially not me. So while she doesn't want him as a bf, she doesn't want me with him either. He has approval issues, especially ones involving a mother figure, and my rival is almost 20 years his senior so I think that's a great deal to do with his reluctance to cut off the woman who's stated to a mutual friend that she'll not allow me living in "her house", as she refers to my guy's home. I should add that although I'm certain she doesn't practice root work or any other type of magic, she has friends that I know may. So I know I need to prepare a strong breakup. I'm thinking a vinegar bottle for sure, to anger and bitterness between them, but I'd also like to see her attached to another man. I think it best she "dumps" him, to make it final for him. I'd prefer to try this option at this time as opposed to hotfooting or goofering her -- leaving won't necessarily disrupt them entirely as they're both fairly free to travel at any time, and I don't want him feeling sorry for her because she's ill, or mourning a dead love. I believe in this case it's best to try to see her paired with another "better" man so she'll lose interest in mine, and he'll be angry at her for deserting him. What sort of trick is best for this? And can I have two working in my home at the same time? Also I know I'll want to work something to bring him even closer to me, a fidelity spell? And finally and a bit off topic, I know, but I will be working an ammonia jar for a work situation. I'm good with it, just want to know if this is all to much to go on at the same time; and if it's not good, in what order do I need to work? Thanks in advance for any help, I truly appreciate it. littlestevie wrote: ... I know I need to prepare a strong breakup. I'm thinking a vinegar bottle for sure, to anger and bitterness between them, but I'd also like to see her attached to another man. ... I believe in this case it's best to try to see her paired with another "better" man so she'll lose interest in mine, and he'll be angry at her for deserting him. What sort of trick is best for this? I'm thinking cut and clear work with figural candles. Have an extra male candle waiting; name it for her Ideal Lover, Anyone But My Boyfriend. Then, as her candle moves away from your boyfriend's, it's moving toward her new man. And can I have two working in my home at the same time? Also I know I'll want to work something to bring him even closer to me, a fidelity spell? Yes! Honey jars, or a doll baby, or a nation sack, even! Or feeding him your menstrual blood or bathwater in a nice plate of cookies or pot of coffee. and if it's not good, in what order do I need to work? I'd do the most urgent spell first. You want her to go first of all, and next you want her to find another partner. I see what MissMichaele was sayinq and I stand behind it. Cut N Clear Movinq candles would be qreat to do, seperate that woman and have her move away from him onto another man to latch onto. Here are a couple of links on how to conjure it. Thank you, TBanks! These are the perfect finishing touches. Thanks everyone, your advice is awesome. This guy was looking for me for 3 yrs but I moved 4 city's away to go to college to pursue my career as a registered nurse and did not see him. after that I lost his number and his mom moved and I don't talk to his friends and did not want them to see me desperate looking for him because they won't tell me where he is at because people were jealous of our relationship back then. Well this guy loved me a lot and he was going to marry me and be with me but I left to pursue my career and left him behind looking for me. He gave up looking for me in 2012. We finally found each other on facebook and they live in another state together and I live in another state too. He comes back to my state every year because his mom lives in the same city I do. He contacted me and told me he does not want to be with her and that he is just with her because they have a child together that is the only reason why he stays and she does not work he supports her so he does not feel right just leaving her but he says he wants to be with me and he always loved me and was looking for me for 3 yrs and he could not find me so he thought I moved on so he did too but it was not easy and he still thinks about me till this day and dreams about me and I have dreams about him too since the last time we seen each other. He says he wishes I would have been the one to be his wife instead and that he loves me more that I was his first love. I want to be with him too but I am in a relationship with someone else of 3 yrs and we have a child together too. I have told him of the guy that got away and I still love him that I love 2 people. But I love the 1st guy more and I am only here with him because we have a baby together. I want to know if there is a spell I can do that will make her leave him for someone else and give him a divorce without making them fight with each other and he would still be able to see his kid but want nothing to do with him ever again. I don't want anything bad to happen to her I just want to draw someone else to her that is willing to support her and take care of her financially. I also want to know if there is a spell I can do to make my guy accept to let me leave him and let me be happy I don't want to fight with him and go thru court issues of custody battles for our baby I just want to peacefully part and let him see his child I can support my baby by myself I have a good paying job and have no use to get child support from him. I want my guy to find someone else too. I have her first and last name and a picture of her by herself a full body one and a head one and one with both of them together I know what month and day she was born I just don't know the year. I have the guy I want picture a full body one and a head one I forgot his bday I just know he is a Sagittarius. Can I do something with the picture still even thou I don't know the exact birthdays. I need help. I get depressed when I think about this situation I wish things would have happened differently. Maybe a simple spell like a skull candle with oil or herbs that is really known of working for people here on the forum or anything helps. sure you wanna shake up your current setup for this? I have thought of that too trust me and i refuse to be the second woman. I wanted to get a reading but i don't know how to go about it and the shop was closed by the time i made up my mind and was obsessing about it all day. So i went to a good friend of mine that is a good tarot reader and i paid her for a reading and the reading said that he does not love her that something is holding them together and that is why he sticks around. He is unhappy in his life because of another love connection he still has for someone else. From to what she described it looks like it is me he still yearns for and that he leaves her at home and works long hours sometimes far away from home so he would not have to be with her and he day dreams about me from time to time and he weeps. I checked her facebook today and I saw a message on her timeline telling him that she misses him and she wish he was there with her but that is too bad because he went to work another state. He works for a oil company and stays in my state for 5 months then after 5 months he goes back to his wife until he gets work again and leaves out of state again. I just checked his facebook timeline and that is what it said because his mom left him a message on one of his pics with him working a bobcat and wrote "It looks like your working" and that was 5 months ago and he wrote " Yes mom im working they call me to work in California for 5 months at a time". He is on his way driving to my state right now and will be here in 3 days from texas. My friend the reader said the guy has good intentions towards me and he does love me that he has not completely got over me and thinks about me from time to time and is sad and regrets a lot of things and he wants to change things but he gets depressed because he does not want her to take his kid and not see him anymore. So he is stuck and does not know which route to take. There is hope of us being together and that we will be happy and things will work out between us and that I am strong minded and determined and willing to sacrifice everything to make this relationship work and I will get what I want but it will take some time for any working to manifest and tend to decide to do. He just left today he has not gave me his number nor have I asked for it I want to have them completely broken up before I pursue him any further and I want to be completely over with my baby's daddy too I don't want to hide and keep them a secret from each other because things can get ugly. I have 5 months to do this and see results and hopefully when he comes back to her he finds out she is with someone else and he leaves her and comes back to my state to be with me. I really love this man and he loves me too but he is stuck in a situation he thinks has no hope and he does not want to hurt her feelings. And for me it would take a while to let my baby daddy let me go and move on because he is jealous and stubborn and if i just leave him he will give me nothing but problems and the guy i want to be with problems and that there will be a fight in between them and one of them will go to the hospital and the other will go to prison for a very long time for hurting the other guy and putting him in the hospital. My baby's daddy is a black belt in mixed martial arts so i think i know who will get hurt and i don't want that to happen. So i am really going to have to work any spell i tend to do like crazy. I won't stop till i get what i want. The only people you can book readings with directly by calling Lucky Mojo are Miss cat yronwode and (I believe) Miss Elvyra. However, you can also contact any member of AIRR directly at http://readersandrootworkers.org. You can either E-mail or call them using the info on their contact page, or click on the caption under their photograph that begins "Book a reading ..." This takes you to a PayPal link where you can pay for reading right away. Your situation is very complex -- there are two children involved, yours and his, and you are breaking up two marriages to spouses who are not at all eager to leave. I would start by doing protection and blessing work for the children. Usually, this spell is done to send away an outside lover. However, I have also used it at the request of a spouse to break up an unhappy marriage and send the other spouse into a new relationship. On the far right, you will see a single candle on the blade side of that pair of scissors. Use a red or blue candle, not a black one, and name it for yourself, not for the outside lover. Name the paired candles for the spouse you wish to separate from and "Her (or His) Ideal Lover." And here is another spell for people who wish an amicable divorce and new love for their ex-partner. 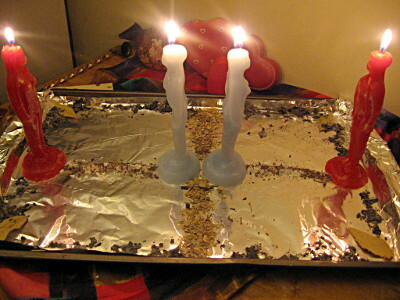 For this client, I named the blue candles in the center for him and his wife. The red candles are for their respective ideal lovers. 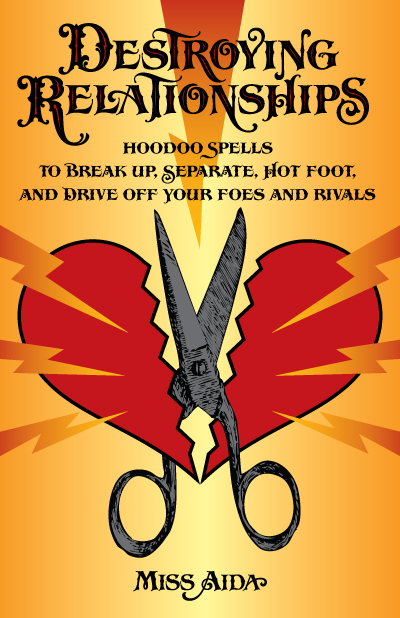 Since you're trying to break up two relationships, you might want to do both spells; the first one on your former love's marriage and the second one on you and your child's father. Last edited by MissMichaele on Sun Jul 27, 2014 9:06 pm, edited 1 time in total. have you thought about whether this spell is justified at all? I know you may love him and he you but other people are involved and feelings and families are there as well. It's such a huge ripple affect. He may want to be with you but not destroy his family as he may actually like/love his wife. I would be checking to make sure that this is approved by in God's eyes. That is lovely to hear dream, I understood that you weren't going to leave her destitute and unhappy. I just wanted to ensure that sometimes God has a plan and we may not be aware of it is all. I wasn't wanting to put anyone down or make them feel bad, just that it may need to be looked at before going ahead with it. Could you be more specific? Is there a particular spell to break up a couple and find new love for the other lover that you're asking about? I need help. Someone I'm very interested in and who is very interested in me is still entertaining/involved with/seeing an ex. I am a woman and they are women also. It's one of those things where they've been together for a little while...maybe 2 years and the other woman does not want to let her go. Can I ask about 2 methods? I want to know the process of simply breaking them up and also the process of breaking them up and sending her ex/current thing to another woman because I want her and she deserves much better than the infidelity and fighting/arguing that they've been through. Thanks for your comments and help guys! Your post is right here on the thread that has 2 pages of spell ideas. Please pay close attention to the ones with pictures depicting how to move her away from the other person and toward you. Hello, I have an odd situation that I would like some advice in how to handle it. I am dating someone who I genuinely care about, but the relationship just is not working. We have talked and I get the impression that she does realize that fact, but just does not want to let go for fear of the 'failure' stigma. I want to bring someone into her life that will provide all of the love and attention she needs the way she needs it. Nothing malicious, I really do want her to be happy. I just know that she will never be with me. It's very kind of you to want to do this so your partner can find someone better suited for her. You may want to do a moving candle spell to have her walk away from you towards a new lover. You could also have one done on your behalf. I second Mezan's advice and think a moving candle spell is the best route for you. Good luck, you sound like a lovely person and I hope you can find her a wonderful new partner. I read through the posts about moving spells, most of them seem to be trying to stop an affair or similar situation. Do you have any ideas of how I could customize this to my situation? Also what candle colors would be appropriate? Thanks in advance! You just name one candle after you and name another candle after her. Name the new person's candle. Have her candle move away from your candle and toward the new person's candle. On your candle and the back of her candle, have break up/separation. Hi all i am hoping someone can help. I believe in law if 3 fold and karma. I really need someone to move away from me and my husband. She works close to where me and my husband work and i believe he has a crush on her and she him. She is a lot younger than me and very attractive and its destroying me and our marriage. As long as she is there under his nose it will remain a serious issue. We have a child so i want our marriage to work. I don't wish the other girl any harm. She is young and probably unaware of the problems she is causing. Is there a non harmful spell i could cast that would maybe put a perfect job opportunity her way that would result in her moving jobs...preferably to a new job somewhere where me and my husband do not go? I only know her name and avoid going near her place of work as i cant bring myself to look at her. First let me say that I think that your intentions of wanting to move her away are justified. He is your husband after all and the bible says "What God has put together, let no man tear asunder" so you are certainly within your rights. I admire your care for her in spite of the circumstance. Bravo! You said you only know her name Well chère, that's about all you NEED! There's SO much in a name and there are several things you can do that are not harmful! Freezing her out of you and your husbands life could be effective. You could also perform a container spell which you would deploy into a moving body of water such as a river or stream to "carry her away from you". You could burn road opener and job candles on her name specifying the request for her to receive offers from abroad or just out of state. You would also want to do some work to keep him out of contact with her however. I watch movies a lot and I've found the best kind of side-piece or mistress to have is one that's out of town! Haha. Fore more information on this, you should really check out Miss Aida's book "Destroying Relationships". It's stock full of useful spells and tricks, both malicious as well as amicable. It's posted just above your query. Good luck! Thank you so much for your reply! I really am at a loss as for what to do but obviously wish no harm to anyone. Its constantly put in my face with all my male work colleagues going on about how gorgeous she is...my husband is very attractive and it is making me self loathe which is obviously going to make me even less attractive in my husbands eyes. Can you elaborate on the road opener spells please?.should I maybe team the spell with some sort of protection spell also? I don't believe you need any protection work done unless you fear you are in danger of being harmed physically or magico-spiritually. As far as the road opening goes, the simple setting of lights can prove effective. Steady Work candles, Road Opener candles simply burned on her name with specific yet concise petitions etc. 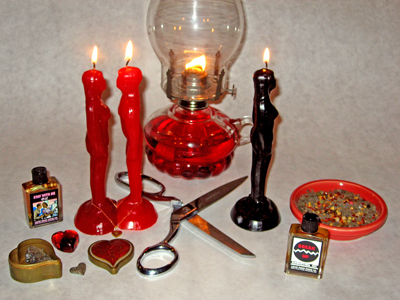 I love working with candles so if that's you too, then you can find a lot of useful information in Miss Cat and Mikhail Strabo's The Art of Hoodoo Candle Magic which of course you can purchase here. 1. I have searched uk suppliers for these candles and can't seem to find anything at all. 2. Can i create these candles myself? 3. Also the petitions..should these be written on brown parchment paper? Is there a specific ink that i should use? 1. You are at the Lucky Mojo Forum. We are located in the USA -- in Forestville, California. We ship candles to UK customers all the time. Also, for those who do not wish to pay for shipping and burn the candles themselves, we offer a candle setting service at Missionary Independent Spiritual Church. 2. Feel free to do that. This forum is not for DIY crafters, however, because it is supported by our shop, where we make and package authentic old-style spiritual supplies, including incense, candles, candle-dressing oils, and herbs, for practitioners of hoodoo, rootwork, and conjure. I would do a moving candle spell where you would have 4 candles two male two female. Put his candle to her back candle, dress the back with break up. Put come to me and love oils on their fronts. Dress a new male candle as new male lover for her place it on the opposite side of the set up, place your candle dressed with love oils opposite side of his (guy you wants candle), each day for 7 days light the candles and move them , hers to the new man, his to your candle. Burn a clarity candle to help them both see clearly that it is over.